Japan’s social game networking service giant Gree announced today November 2 that it had established a new invest subsidiary Gree Ventures. Gree Ventures is going to form GV-I Investment Partnership, which is planned to invest (tantative) 2 billion yen (US$25.6 million) in total. TOKYO, Japan – November 2, 2011 – GREE today announced that it has resolved to enter the venture capital business with a focus on Internet business-related start-up companies. For the entry, GREE has established a wholly-owned subsidiary, GREE Ventures, and formed a GV-I investment partnership which globally invests in Internet-related businesses under the management of GREE Ventures. Aiming to boost the Internet market, not only in Japan but throughout the world, GREE will support the growth of promising unlisted venture companies which operate mainly in the Internet market in Southeast Asia and East Asia, where long term expansion is expected. As TechCrunch reported yesterday, video publishing platform Ooyala from the US plans to bolster its activities in Asia after raising a $22 million series D round (the company is now funded with $42 million in total). TechCrunch quotes CEO Fulcher as saying that future markets include places like Japan, Taiwan, China, and Korea. What’s interesting is that some of the fresh money comes from Asian investors, namely Chinese private equity firm CID and Itochu Technology Ventures (ITV) from Japan. While the amount of money CID invested is unknown, The Nikkei is reporting that ITV (which is the investment arm of major trading and Fortune 500 company Itochu) has participated in the new round with $2 million. In Japan, Ooyala has been cooperating with Osaka-based NTT Smartconnect since January this year and now offers a localized version of its service. Ooyala is currently being used by 500 companies worldwide, but especially in Japan, it faces stiff competition by its American rival Brightcove. Brightcove Japan already boasts deals with over 100 local companies after it was established in 2008, funded by the world’s biggest ad agency Dentsu, major IT outsourcing company transcosmos, and other local firms. A Japanese Internet startup that not only has international ambitions but that’s also able to receive a substantial amount of seed money is a very, very rare beast. But today, we can report that such a beast has been sighted. 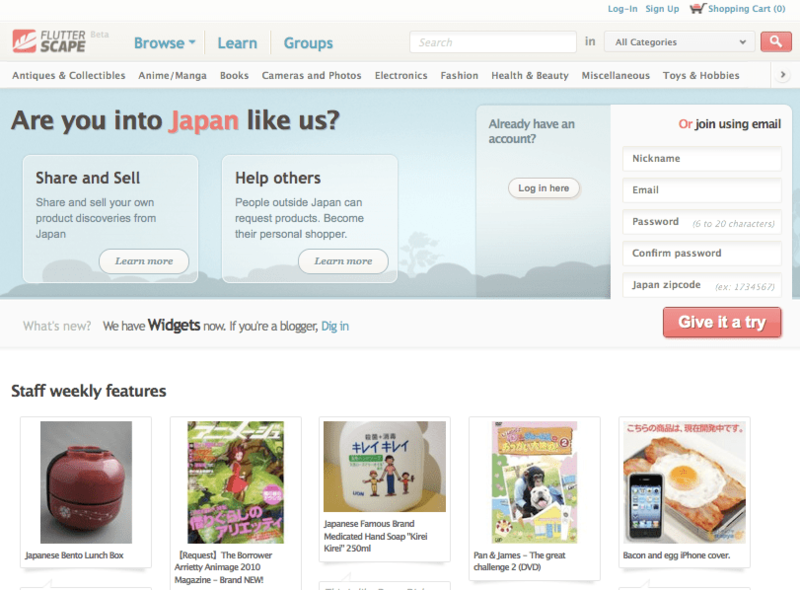 Singaporean tech blog e27 just broke the news that Tokyo-based Flutterscape, a cross-border social marketplace for all things Japanese, has closed a seed investment round worth $177,000. The money comes from Tokyo-based Digital Garage, which is listed at the Tokyo Stock Exchange and is (among other things) Twitter’s official partner in Japan. Earlier this month, Flutterscape scored another seed investment ($118,000) from major Japanese auction platform AucFan, bringing the total amount raised to close to $300,000. That’s a quite handsome amount of money, even by international standards (for a seed investment, at least). Flutterscape is available in English only (there’s no Japanese UI). Flutterscape currently counts just three full-time employees. e27 has more details on the investments from Digital Garage and AucFan and also provides insight on how the service got over 36,000 people to “like” their Facebook page so far. The recession, almost no IPOs, structural shortcomings, not enough hot startups to invest in: The Japanese venture capital industry is in a critical situation. The current state of affairs forces companies that have money to pump into promising ventures to go new ways, and one of these is a joint initiative by a total of eleven companies [JP] from Japan’s Internet sector. 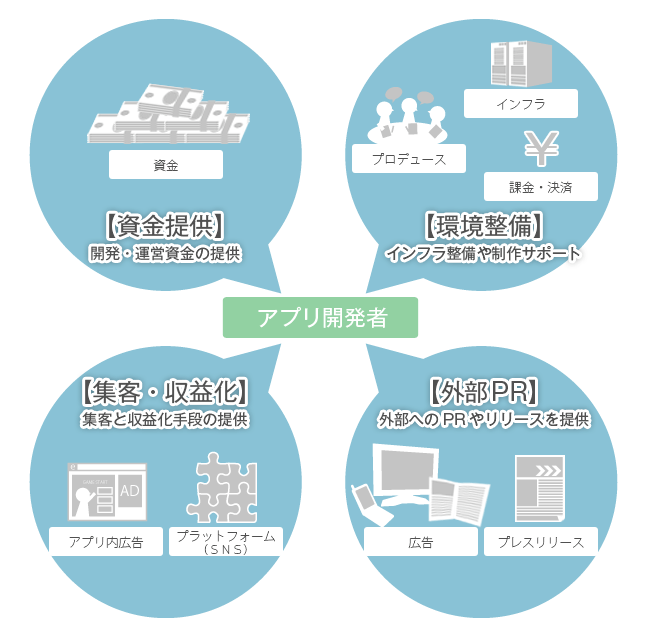 Dubbed Social Application Forum (SAF) [JP], the initiative is led by advertising company Adways [JP] and venture capital firm ngi group. The aim is to invest in startups working on social apps that can be distributed worldwide, for example on Facebook. SAF’s official slogan is “From Japan, to the world”. In other words, the social application bubble just got bigger. The Nikkei is reporting that the investors are ready to start supporting up to 50 different startups working on those apps within this year. The startups will receive marketing and PR support, technical “infrastructure” and money. According to the Nikkei, the budget for 2010 is 1 billion yen ($11 million). The 11 investors plan to get together once per month to review business plans the startups handed in and choose which ones to support. The SAF is obviously aimed at finding the Japanese Zynga, but I have my doubts (for a number of reasons) this framework is the best approach to nurture a globally competitive app provider. But Asiajin is more than happy to cover interesting stuff (if there is any) coming out of this initiative in the future even though I believe the apps will land on Mixi and other Japanese sites.